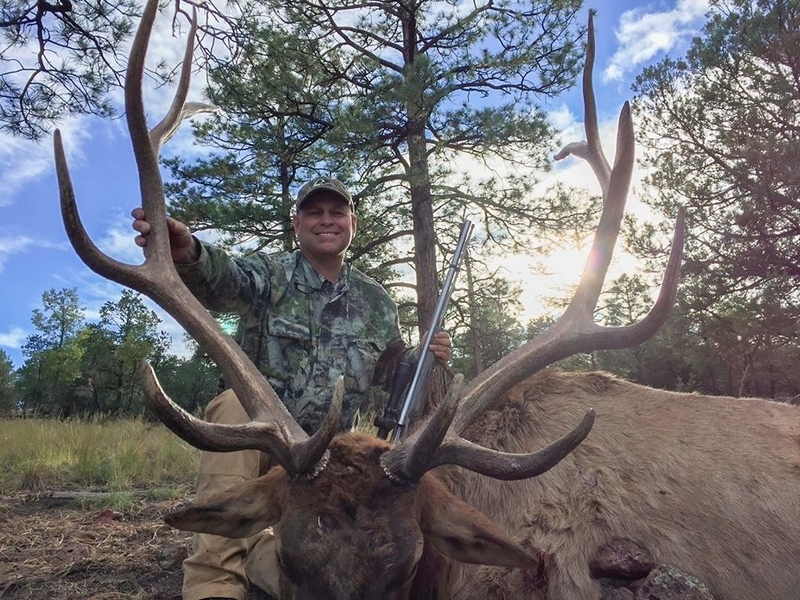 Above, a happy John Fink poses with his New Mexico bull Elk taken with his Remington Model 700 Ultimate Muzzleloader. John took this bull using the standard Remington recommended long range load of four 50 grain equivalent Hodgdon Triple Se7en pellets (a.k.a. “200 grains”) and the standard Remington / Barnes 250 grain Premier Accu-Tip developed by Remington, Barnes, and MMP. According to John, the bullet was recovered from the hide on the off-side. A fellow hunter, on the same New Mexico adventure with John, took his bull with the very same load at 300 yards. Again, the bullet was recovered from beneath the hide on the far side. Apparently the wound channel was very similar, except the bullet used on the 300 yard bull did not have quite the amount of deformation. Some might think a 250 grain bullet it too light for elk and I agree, if a lead bullet was used. With a Barnes all-copper bullet, you can use a lighter bullet than common lead cup and core type bullets. Even then, I personally like two holes, so the 290 grain Barnes Spit-Fire T-EZ (Barnes #30607) is what I've used on Kudu, Warthog, wild boar, and some fat, heavy Minnesota black bears with superb results. It normally takes a sabot change, to the MMP HPH-12, for higher velocity load accuracy. I've mentioned this before, at http://randywakeman.com/Remington700UltimateMuzzleloaderLoads.htm , but the with 115, 120, 130, 136, and 143 grain volumetric charges of Blackhorn 209, the following bullets and sabots are all sub-MOA loads: twenty-five combinations thus far. Your results will vary. The flattest-shooting bullet you can get is the Parker Match Hunter 300 grain: in my individual Remington 700 Ultimate, it is also the most accurate. It is never a bad idea to let your gun tell you what it likes to be fed, for it always knows best. The Remington Ultimate muzzleloader has really taken off, for every month there are many thousand views on this website on the Remington Ultimate Muzzleloader loads alone, and some 300-400 e-mails on the topic. According to Remington, you can use up to four 50 grain equivalent pellets whether Triple Se7en, IMR White Hots, or Alliant Blue-MZ pellets, or 150 grains by volume of Blackhorn 209 or Triple Se7en FFg. You can also use three of the Triple Se7en “Magnum” pellets that Hodgdon rates as 60 grain equivalent pellets for a “180 grain” load. The Remington has a 1:26 rate of twist barrel, so it will stabilize the long, ballistically efficient Parker Match Hunter bullets where 1:28 barrels will not. Some of the most common questions are answered at http://www.randywakeman.com/RemingtonModel700UltimateMuzzleloaderFrequentlyAskedQuestions.htm . Just because you can use higher propellant charges out of the Remington Ultimate doesn't mean you have to, of course. Just 120 grains by volume, 84 grains by actual weight of Blackhorn 209 nets you right at 2100 fps with a 300 grain bullet: this is a massively huge performance boost from the traditional blackpowder velocities of 1600 fps with 100 grains of FFg blackpowder or Pyrodex . . . and is a 300 yard load right there, with the right bullet. Regardless, the Remington 700 Ultimate Muzzleloader is a superb product and every 700 Ultimate sold in 2016 and on has a written lifetime warranty as icing on a high-performance cake. Congratulations again to a happy John Fink. John's always happy, he just seems a just little bit happier after a successful big game hunt, that's all.